edition I 2014: oh happy day! 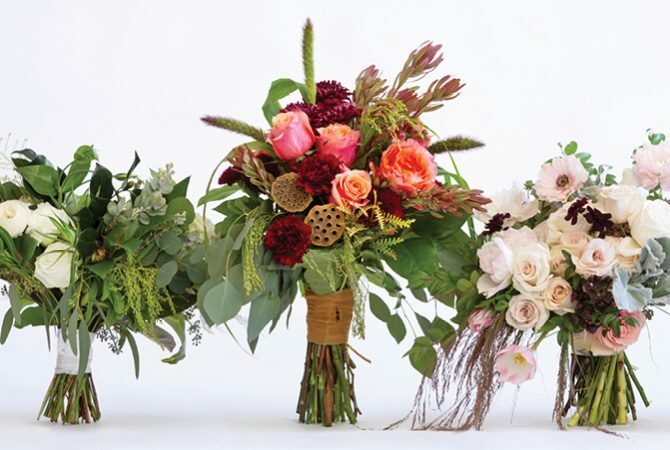 With spring and summer weddings just around the corner, we asked the team at Pigmint Flowers & Gifts to envision a setting—perhaps for a rehearsal dinner or small, intimate wedding—fit for a fun-loving bride and groom. Using the clean architecture of Springdale’s Fairlane Station as a backdrop, they created a bright, citrus-inspired fête. A small sideboard, made from a painted door and wooden slab, is the perfect spot to serve the light appetizers to guests. The Pink Piano garden roses, which are also used in the centerpiece arrangements, create a simple, one-flower bouquet, while cut kumquat branches carry over the citrus theme. Preppy pinks, garden-inspired greens and imaginative shades of coral, peach, and amber create the cheerful palette. Using the floral colors as a starting point, Pigmint worked with Eventures to select linens and dinnerware to coordinate with the hues. The goal was to create a spectrum of shades within the palette rather than to match everything exactly. The dramatic contrast of brights against the black-and-white setting makes for a modern look. Barn-style doors at either end of the room open to invite guests to mingle indoors and outside. The table’s three centerpiece arrangements feature Cherry Brandy standard roses, which have a coral orange exterior and open to reveal amber hues, as well as bright Pink Piano garden roses and kumquat branches grouped together in bleached wood containers. Contemporary acrylic boxes hold popcorn to snack on before dinner is served. A variety of toppings, including Early Bird Catering’s signature dill seasoning, allow guests to personalize the treat to their liking. Mary’s Rose, a rosemary-infused vodka lemonade made by Early Bird Catering, is a colorful signature drink. Lemon slices and mint sprigs not only add garnish to the glasses, but also additional flavor. Small polka-dot straws with letterpress jewel toppers mimic the setting’s color scheme. The Fairlane Station sign hangs outside the main entrance. 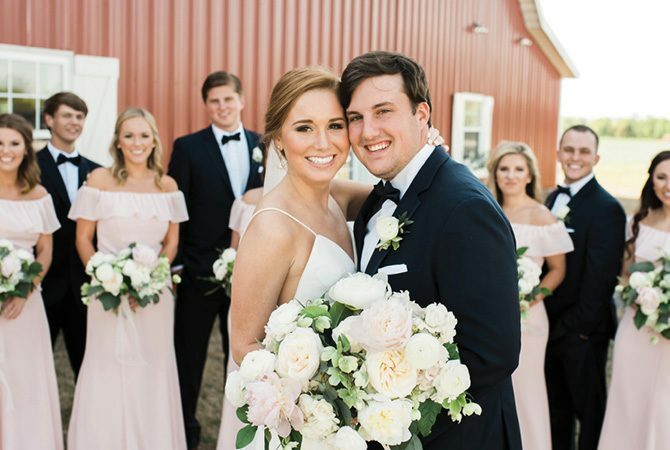 Time to take a break, relax, and indulge yourself in the gorgeous barn ceremony of Lauren and Keith McDaniel. Our favorite touches? Yellow and white bouquets, bridal party portraits in lush green fields, and lights galore in a boot-stomping reception. Thank you to Hudson Photography for sharing the following images! A very special occasion indeed! We wish Lauren and Keith years of love and happiness! Time for another real Arkansas wedding! 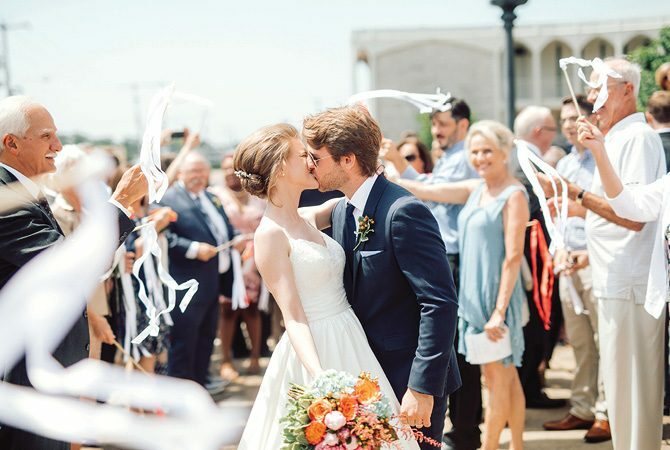 You will be absolutely inspired from the unique and colorful details of this summer wedding. 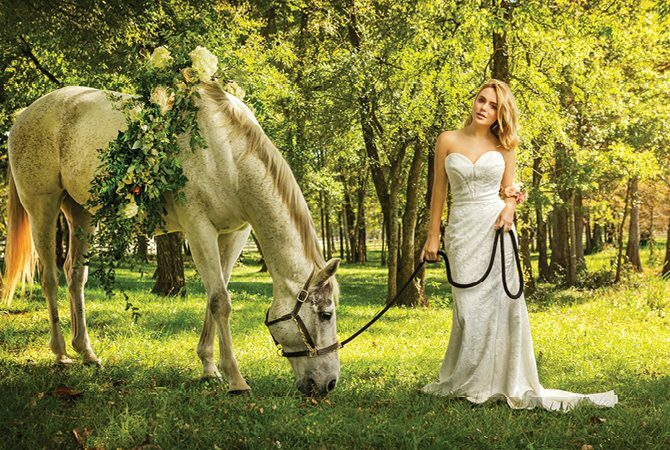 Lindley Summers and Caleb Snowden were married September 1, 2013 at the Stables on the Hill in Fayetteville. 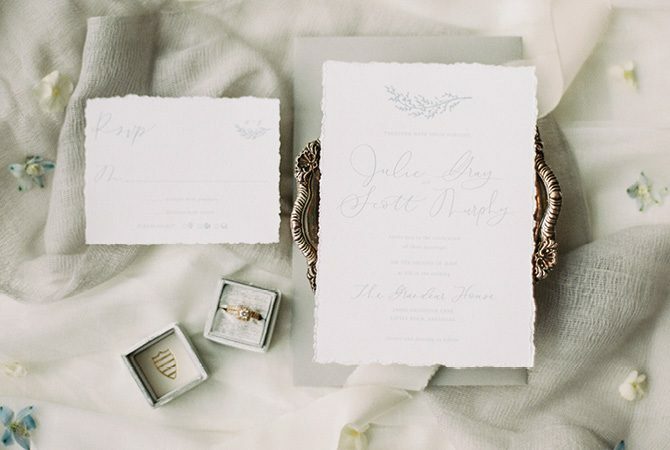 Below are some of our favorite images captured by Kaity Whitman of Photo Love. Keep an eye out for antique treasures, handmade elements, and lovely pastels. The bride handmade the wedding programs which also served as fans! 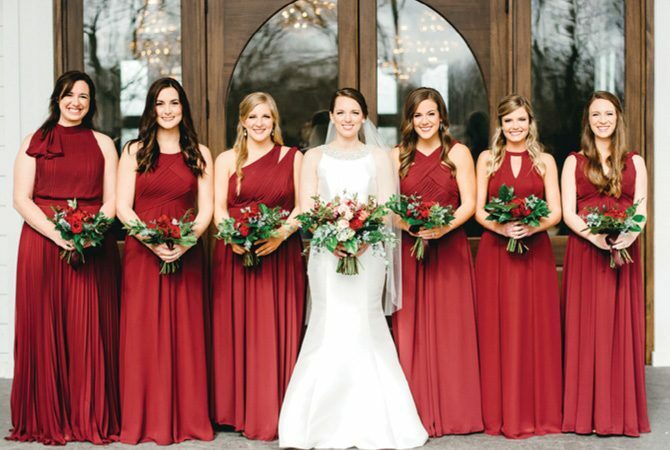 What is that gorgeous flower in the center of the bouquet? A Protea King flower, shipped in from Africa! Designed by Pigmint Florist. 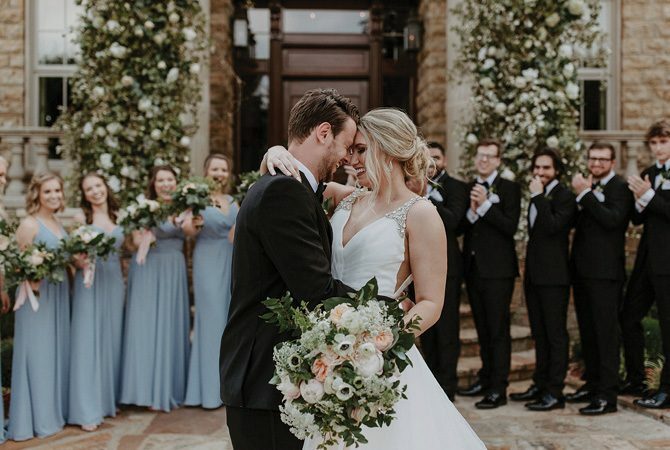 Don’t you just love this perfectly candid first look? The groom carved a jewelry box by hand for the bride’s “day of wedding” gift. Inside – a vintage gold “S” locket! Instead of flower petals, the flower girl threw paper hearts punched from old vintage books. The bride’s uncle performed all wedding music with his acoustic guitar, including the wedding march which he learned for the ceremony. Tying the knot!During the ceremony, the couple tied a fisherman’s knot to represent unity. They chose the fisherman’s knot because it is regarded as the strongest knot known to man. The rope will break before the knot will! The couples plans to frame the rope in their home as a reminder of their special day. In preparation for the wedding, the couple spent weekends exploring flea markets and hand picking vintage treasures for wedding decor. The furniture for the wedding display was refurbished and hand painted by the bride. Family heirlooms such as quilts, books, mason jars, and even a Great Grandmother’s old camera were essential decor accents. Family members brought in homemade pies and other desserts, some made from famous family recipes! Name plates labeled each dessert and paid tribute to the baker. Such fun! The groom’s father restored this bright yellow 1977 Jeep Wrangler for the getaway car. Wow! 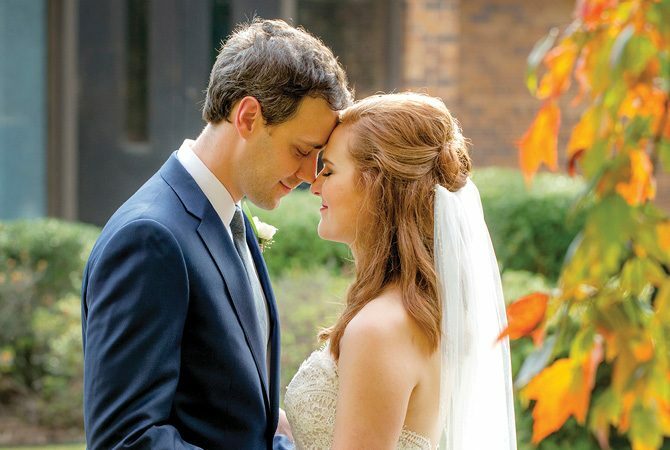 With so many personal touches, this self-designed wedding was truly the vision of the bride and groom. Warm wishes to Lindley and Caleb! We hope your years together reflect the beauty and thoughtfulness of this special day.